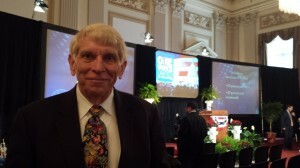 RFC Chairman William J. Murray at National Day Of Prayer, Washington, D.C.
Today is the 63rd annual National Day Of Prayer and events are taking place all day in Washington, D.C. and around the nation. 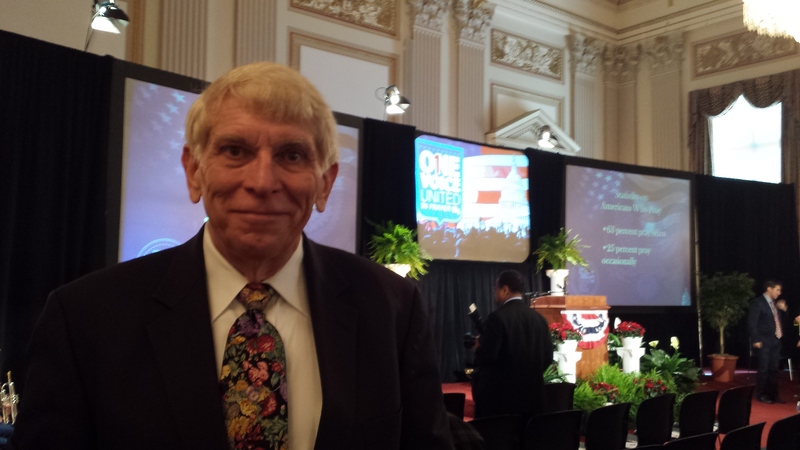 RFC Chairman William J. Murray is taking part in this event in Washington, D.C.
On April 30th, Murray participated in the Bible Reading Marathon on the steps of the Capitol Building. This event is held every year and culminates on the National Day of Prayer. During several days, the entire Bible is read from cover to cover by ministers and Christian leaders from around the world. He was also involved in briefings on April 30th by congressional leaders. 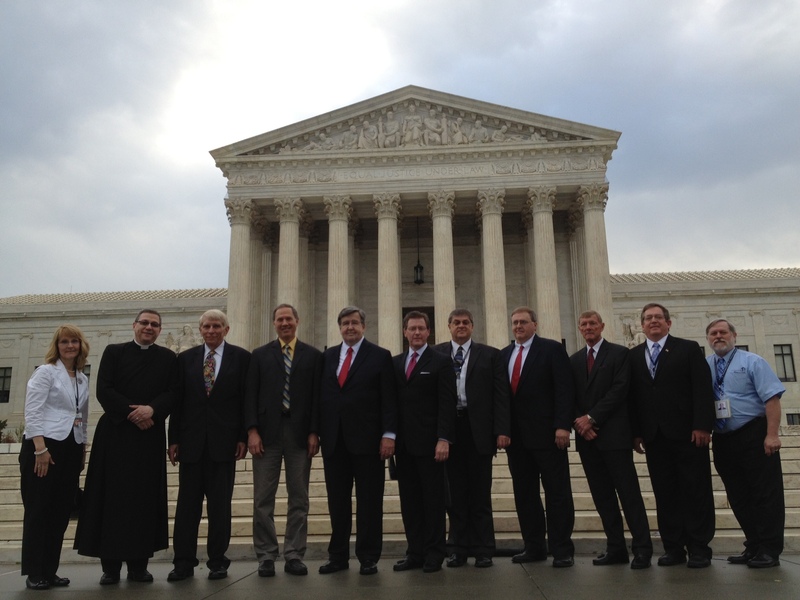 On May 1st a handful of Christian leaders, including Murray, are praying on the steps of the Supreme Court. This is allowed by special permission from the Court and only ten or so people can participate. After the prayer, the group had breakfast inside at the Supreme Court cafeteria, the same one used by the Justices. They then proceeded to the National Day of Prayer event at the Capitol which is organized by Shirley Dobson, the wife of Dr. James Dobson. William J. Murray with a Prayer Team early this morning. After the celebration, Murray’s day is far from over. He is scheduled to have lunch with Congressman Steve King of Iowa. Congressman King is a strong social conservative and will not hire anyone for his staff who is not pro-life. He also has a short meeting that day with Senator Rand Paul to discuss the death sentences being handed out to Christians in Pakistan on charges of blasphemy; more details on these cases are in this issue of the Chairman’s Report. May 1st is the National Day of Prayer. Since 1988, by law the first Thursday in May has been set aside for national prayer, reflection and repentance. Presidents Ronald Reagan, George H.W. Bush and George W. Bush officially participated and held events for the National Day of Prayer. Presidents Bill Clinton and Barack Obama did not. Regardless of President Obama’s refusal to participate in the National Day of Prayer, there still is official recognition by the Congress. Each year the Caucus Room of the Canon Building is reserved for a Congressional Prayer Breakfast to celebrate the day. Attendance is very limited. Prior to this event, Congressional Prayer Caucus members Congressman Forbes and McIntyre introduced a resolution in support of the National Day of Prayer. It recognizes the role that prayer has played in our nation’s history. May God continue to bless you Mr. Murray for standing up for the right thing. We ALL need to be right by your side today, thank you so much for being there for those of us that cannot be. May God always stand by your side and protect you.